Exclusive sandwich contest has been organized by United-21 Thane for its club members (ladies) on 28th March 2012. The event will see members enjoying this contest with lots of fun games and Housie. The birth of sandwich is interesting like its taste. John Montagu incidentally invented sandwich in around 1792. He used to play cards for long hours coz of which he hardly found any time for his lunch or dinner. Once while he was busy in playing cards at the gambling table, he asked his butler to prepare something quick at the gambling table itself. The butler took a piece of meat and kept it between two pieces of bread. It was then when the sandwich was first consumed. Any kind of bread, rolls and buns can be used for the preparation of sandwiches. The filling inside the sandwich can be anything like raw cucumber, pieces of beet, salad leaves, boiled potato, fried meat, boiled eggs, pieces of chicken etc. One piece of bread is spread with butter, cheese or mint chutney. The required filling is placed on the bread. Then it is covered with the other piece of bread. The sandwich is sliced together to sizeable pieces and served normally with tomato sauce. Some people prefer toast sandwich which is nothing but the normal sandwich toasted in a toaster. The different types of sandwiches you can try like Mint chutney Vegetarian sandwich, Chicken Tikka sandwich, Paneer sandwich, Bread Pakoda sandwich and Mango pickle sandwich. Even fish fillets can be used as the filler for your sandwich. You can prepare a new type of sandwich by using potato filling which is used in making of popular Potato vada. 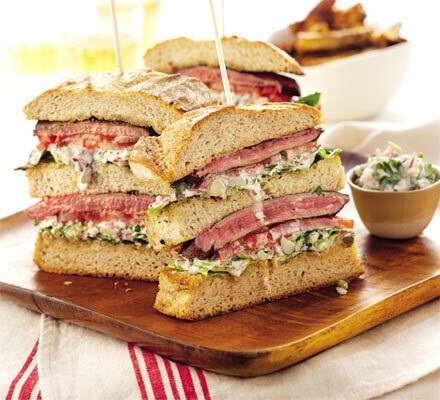 Now, we would see our club members (ladies) using above tips for their preparing sandwiches in tomorrow’s event. By presenting some tasty sandwiches one of the club members surely has a chance to win tomorrow’s sandwich contest.